FORT WORTH, Texas — Joey Logano’s “Final Four” at Texas Motor Speedway had nothing to do with the NCAA Men’s Basketball Championship set for Monday night in nearby Arlington. 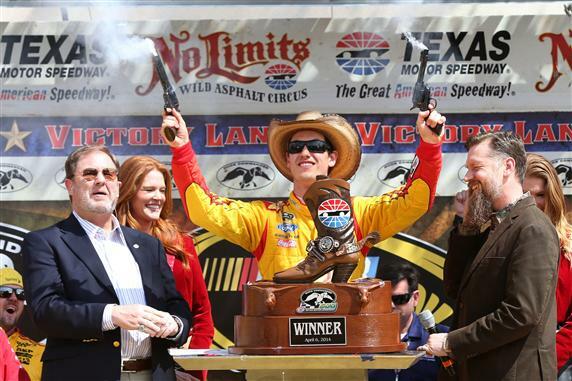 Logano and crew chief Todd Gordon’s decision to pit for four Goodyear Dual Zone tires during the final caution period of the rain-delayed Duck Commander 500 propelled the Team Penske star to his first NASCAR Sprint Cup Series victory of 2014. Logano, 23, scored his first career victory on TMS’ 1.5-mile quad-oval and fourth in 190 career Sprint Cup starts at the expense of four-time series champion Jeff Gordon under a green-white-checkered-flag finish that extended the race to 340 laps from the originally scheduled 334. Logano, driver of the No. 22 Shell Pennzoil / Hertz Ford Fusion, passed Gordon via a crossover move on the inside heading into Turn 1 on Lap 340 en route to margin of victory of 0.476 seconds. Kyle Busch finished third with Brian Vickers and Sunoco Rookie of the Year candidate Kyle Larson rounding out a top five that was shuffled by the day’s seventh and final caution on Lap 333. Logano was working on a 3.053-second lead over teammate Brad Keselowski when Kurt Busch, winner of last week’s race at Martinsville Speedway, brushed the outside wall in Turn 2. During the ensuing pit stops, Logano and Keselowski opted for four tires and fuel. Gordon, of Hendrick Motorsports, and Vickers, of Michael Waltrip Racing, opted for right-side rubber only and exited pit road 1-2. “When you’ve got 40-something laps after the last pit stop and a pretty sizeable lead, really, all you’re thinking is, ‘Where’s the white flag? '” Logano said. “Brad was able to catch us a little bit and then you go into Turn 1 and see the No. 41 (of Kurt Busch) up against the wall and you’re like, ‘Please, no caution.’ And, of course — boom — it comes out and you’re like, ‘You’ve got to be kidding me.’ So you get so mad that you can barely control yourself. Really, I was just so mad. Similarly, Gordon praised crew chief Alan Gustafson for a “great call” to go with two tires on the final stop given his standing when the yellow flew. “I mean, coming in sixth, you’re in that position that you can gamble,” said Gordon, driver of the No. 24 Axalta / Texas A&M School of Engineering Chevrolet SS. “You’re not going to win it with four (tires),you’re not going to win it with none. I knew it was going to be hard to hold those guys off. Keselowski was poised to give team owner Roger Penske a slam-dunk 1-2 finish behind his teammate when the final caution flew. Keselowski exited the pits fourth with four tires, one spot behind Logano. But he was charged with speeding off pit road — a miscue that dropped him to 15th. Gordon emerged as the new points leader after HMS teammate Dale Earnhardt Jr. crashed out of the event on Lap 12, finished 43rd and dropped to sixth in the standings. Gordon holds a four-point (259-255) lead over Matt Kenseth of Joe Gibbs Racing heading into Saturday night’s Bojangles’ Southern 500 at Darlington Raceway. 1. (10) Joey Logano, Ford, 340, $561881. 2. (12) Jeff Gordon, Chevrolet, 340, $364656. 3. (29) Kyle Busch, Toyota, 340, $289211. 4. (23) Brian Vickers, Toyota, 340, $238370. 5. (14) Kyle Larson #, Chevrolet, 340, $202865. 6. (4) Greg Biffle, Ford, 340, $196910. 7. (26) Matt Kenseth, Toyota, 340, $192046. 8. (25) Clint Bowyer, Toyota, 340, $174701. 9. (13) Paul Menard, Chevrolet, 340, $163824. 10. (1) Tony Stewart, Chevrolet, 340, $190243. 11. (32) Kasey Kahne, Chevrolet, 340, $147500. 12. (17) Aric Almirola, Ford, 340, $168306. 13. (6) Denny Hamlin, Toyota, 340, $137770. 14. (5) Carl Edwards, Ford, 340, $143120. 15. (2) Brad Keselowski, Ford, 340, $175053. 16. (8) Ryan Newman, Chevrolet, 340, $133815. 17. (15) Jamie McMurray, Chevrolet, 340, $156729. 18. (18) Martin Truex Jr, Chevrolet, 340, $149723. 19. (7) Trevor Bayne(i), Ford, 339, $116240. 20. (9) Marcos Ambrose, Ford, 339, $146260. 21. (20) Austin Dillon #, Chevrolet, 339, $162251. 22. (39) David Gilliland, Ford, 339, $141773. 23. (33) AJ Allmendinger, Chevrolet, 339, $129898. 24. (22) Justin Allgaier #, Chevrolet, 339, $134573. 25. (16) Jimmie Johnson, Chevrolet, 338, $162051. 26. (31) Ricky Stenhouse Jr., Ford, 338, $145140. 27. (24) Danica Patrick, Chevrolet, 338, $115690. 28. (21) Casey Mears, Chevrolet, 338, $125748. 29. (27) Michael Annett #, Chevrolet, 337, $114162. 30. (28) Michael McDowell, Ford, 335, $101965. 31. (42) Cole Whitt #, Toyota, 335, $98540. 32. (30) Alex Bowman #, Toyota, 335, $100440. 33. (38) Reed Sorenson, Chevrolet, 334, $98840. 34. (40) Landon Cassill(i), Chevrolet, 334, $95240. 35. (43) David Ragan, Ford, 334, $107790. 36. (41) Josh Wise, Chevrolet, 333, $92990. 37. (37) Travis Kvapil, Ford, 332, $91889. 38. (34) David Reutimann, Ford, 332, $84865. 39. (11) Kurt Busch, Chevrolet, Accident, 327, $80865. 40. (36) Parker Kligerman #, Toyota, Overheating, 313, $76865. 41. (35) Dave Blaney, Ford, Steering, 272, $72865. 42. (3) Kevin Harvick, Chevrolet, Engine, 28, $110173. 43. (19) Dale Earnhardt Jr., Chevrolet, Accident, 12, $73640. Time of Race: 3 Hrs, 48 Mins, 02 Secs. Margin of Victory: 0.476 Seconds. Lap Leaders: T. Stewart 1-24; K. Harvick 25; T. Stewart 26-50; R. Sorenson 51; T. Stewart 52-76; B. Keselowski 77-96; J. Gordon 97-98; B. Keselowski 99-121; D. Hamlin 122-140; J. Gordon 141-142; Kyle Busch 143-152; J. Gordon 153-183; B. Keselowski 184-225; J. Logano 226-299; D. Hamlin 300; C. Bowyer 301; J. Logano 302-334; J. Gordon 335-339; J. Logano 340;. Leaders Summary (Driver, Times Lead, Laps Led): J. Logano 3 times for 108 laps; B. Keselowski 3 times for 85 laps; T. Stewart 3 times for 74 laps; J. Gordon 4 times for 40 laps; D. Hamlin 2 times for 20 laps; Kyle Busch 1 time for 10 laps; C. Bowyer 1 time for 1 lap; R. Sorenson 1 time for 1 lap; K. Harvick 1 time for 1 lap. Top 16 in Points: J. Gordon – 259; M. Kenseth – 255; C. Edwards – 247; J. Logano – 235; Kyle Busch – 231; D. Earnhardt Jr. – 228; J. Johnson – 228; B. Keselowski – 218; B. Vickers – 205; P. Menard – 203; R. Newman – 202; A. Dillon # – 202; D. Hamlin – 197; T. Stewart – 189; K. Larson # – 187; G. Biffle – 187.